The weather has been erratic in the Philippines for many months now. But it has been much colder during the night since December. And when it rains, it can also be very cold during the day for dogs from December to February. “Even if your dog has a thick, heavy coat, he might still feel chilly... Pets are just as likely to (have) .. hypothermia (low body temperature) as their owners,“ says Amanda Gardner in Cold Weather Tips for Dog Owners in WebMD. Po and Louise also need clothes when it is cold outside. The good news is: It is easy to protect your dog from the cold. Most of the safety measures you apply to yourself will keep your furbabies safe and warm. 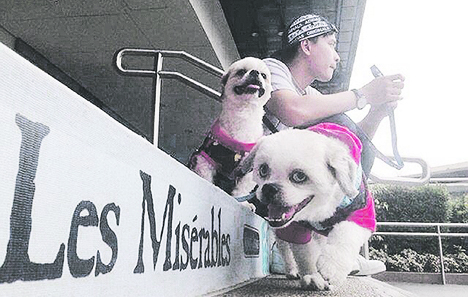 Here are some tips from Gardner for dog owners that can be applied in the Philippines. 1. Limit the time outside the house when it is very cold. This applies to small dogs and short hair dogs in the Philippines. Please keep them inside the house. Medium-sized or large dogs can handle the cold weather outside the house if they have a blanket to lie on or their place or cage is covered partly with a cloth to minimize the cold. There must space for air to circulate in the said space. 2. Dress the dog warmly. Which brings us to the next tip: dogs outside the house do love clothes when it is very cold. Dressing them up can warm them. On the other hand, “small dogs and those with short hair need extra help when there’s a chill in the air. Puppies and older canines also may find it hard to control their body heat," Gardner says. 3. Adding “warming” food in the diet. Gardner adds it is also a great idea to increase the protein and fat in the diet to keep the coat healthy during cold months. In Chinese medicine, “hot food” or food that produces heat in the body are recommended. These include beef, pork or chicken which can be given to dogs. Be on the lookout for symptoms of hypothermia, and know when to call your vet. 5. Get your pet inside when needed. If your dog is whining or looks anxious, bring him inside the house immediately, Gardner says. The other signs that tell you the dog has to be brought to the house are: the dog stops moving or slows down, is shivering, or is looking for a warm place to stay. “These can be signs of hypothermia. Once he’s out of the cold, wrap him in blankets and call the vet for more instructions, “ Garnder says. Put a bottle with warm water wrapped in a towel beside your dog, pup, cat or kitten while waiting for the vet. It is important to check your dog every day for any unusual changes like painful or pale areas,” says Barry Kellogg, VMD, of the Humane Society Veterinary Medical Association. 6. Protect your dog against the elements. “If you have no choice but to leave your dog outside for a time, make sure he has a dry, roomy shelter out of the wind (and cold). The floor should be raised several inches off the ground…Keep the doorway covered with waterproof plastic or canvas. Give him plenty of food, “ says Gardner. 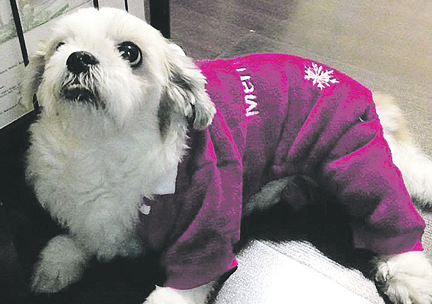 Summer, a 13-year-old shih tzu, needs to keep warm during cold nights. Save Animals of Love and Light (Save ALL) puts panela blankets in sleeping areas of rescued dogs. Save ALL also does not wait for rescued dogs to develop a cold or a cough. Save ALL urges dog owners to provide 3 ml. of any multivitamins daily to keep the immune system strong.